The Great Croquet Caper has become one of the most talked about events in Greenville’s recent history and has a growing number of people abuzz about playing in or supporting next year’s sequel. The grounds and setting were virtually unsurpassed as a venue for old fashioned 9-wicket croquet in tournament form. 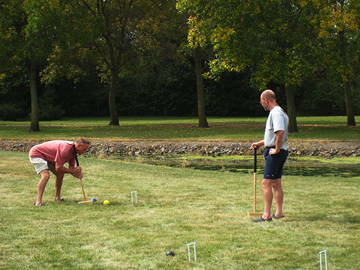 The event was sanctioned by the United States Croquet Association and was directed by none other than Bob Kroeger, one of a very few Croquet “legends” and a truly great ambassador for America’s greatest backyard sport. The Friday evening auction had some incredible items, one of the hottest being a Harley donated for the occasion. The turnout was excellent and the entertainment value was the best. Afterward, a number of people signed up to do a night time croquet clinic with Bob Kroeger, complete with lights on wickets and mallets. The following ninety minutes was filled with laughter and “a-ha’s” as people began to grasp technique and strategy points, trying them out in the dark. The morning brought a gorgeous, though hot day and a great crowd of spectators. A pancake breakfast, a chicken barbecue, a car show, and farmers market served as additional highlights and crowd pleasers. There were over 500 people in that crowd. The doubles tournament marked a first for Croquet Your Way, experimenting with the more complex 6 Wicket game in the Pro division while amateurs stuck with the traditional 9 Wicket game. Nearly 100 players registered for the competition. Read the rest of this article at Croquet Your Way.